Harry Tinkler, one of the Bottesford British Legion skittles team, 1930s. From the private collection of Mrs Anne Hewitt. Harry Tinkler, flanked by fellow ex-WW1 servicemen Harry Bugg (to his left) and Tommy Robinson (to his right), in a church choir picture, c.1950. Harry Tinkler was recorded on the Bottesford list of Absentee Voters, 1918/19, his address at Retford’s Cottages. His Service Numbers were WR274043 and 283650, Sapper, 297th Coy, R.E. 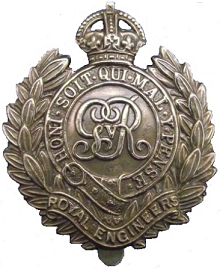 (Royal Engineers). The address, ‘Retford’s Cottages’, refers to an enclosed, terraced close built behind the cottages in the northern side of Chapel Street, Bottesford. It was demolished in the 1960s. 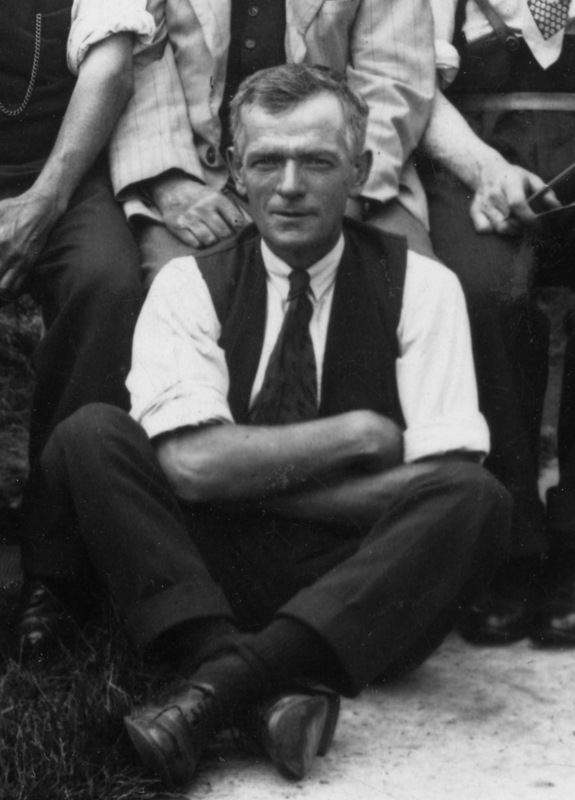 Harry Tinkler was born in Bottesford in 1891, son of Samuel Tinkler, who was born in Woolsthorpe in 1860, and his wife Priscilla born in Denton in 1863. Samuel Tinkler was an iron ore worker. In 1891, the family lived on Bottesford High Street. There were four children: Jane (8), Ethel (5), Emma (2) and Harry (1). In 1901, the family lived on the High Street, Bottesford. Samuel was employed as an ironstone labourer. Harry, aged 10, was at school. They had had another child, Albert, aged 1. In 1911, they had moved to ‘Riverside’ (Riverside Cottage, Rectory Lane, Bottesford, today). Samuel was still an ironstone miner, but Harry had employment as a domestic gardener working at the Bottesford Vineries, Belvoir Road. He was now a married man: his wife was Rosetta (Rose), nee Saunders. Harry Tinkler was a sapper in the Royal Engineers, in a sub-unit working on railways. The Absentee Voters list records that his Service Numbers were WR 274043 and 283650, and that he was a sapper in 297th Coy, Royal Engineers. The 297th Coy, RE, operated in France & Flanders, building standard gauge (broad gauge) railways. His service records were not found by online searches, and may not have survived. His Medal Index Card indicates that he was awarded the British War Medal and the Victory Medal. Electoral Rolls for Bottesford, from 1921 to 1929, show that Harry and Rose Tinkler lived at Retford’s Cottages throughout this period of their lives. He played an active part in village life, and was elected Hon. Secretary and Treasurer of the Bottesford branch of the Royal British Legion in 1930. He was also a long-serving member of the church choir, seen in a picture of the choir taken after the end of WW2. He died on the 19th May, 1961, aged 70, in Grantham hospital. In his later years, he lived on the High Street. He left an estate of £1059 8s to his wife, Rosetta Tinkler. His service records were not located, and may have been destroyed.